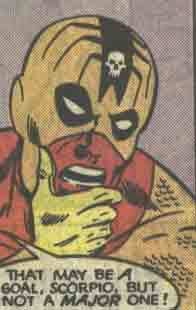 Powers/Abilities: Scorpio was gifted at hand-to-hand combat. History: (Avengers I#120 (fb) BTS) - Jacques LaPoint was brought into the Zodiac Cartel to replace Jake Fury, the previous Scorpio. (Avengers I#120) - Scorpio joined the Zodiac Cartel in an attack on the Avengers Mansion, and defeated the Avengers gathered there simply to demonstrate their might. He then participated in their plot to use the Star-Blaster to slay everyone born under the sign of the Gemini (except for their own Gemini), and joined Aries in arguing with Gemini, who they distrusted, but Taurus broke up their squabble. 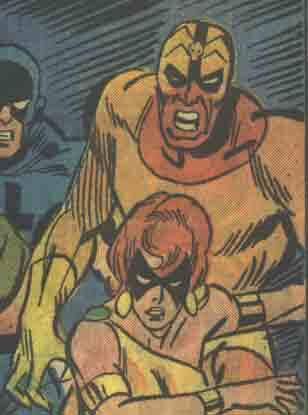 When the Avengers intervened, Taurus was able to halt the Avengers by threatening to kill Mantis with the Star-Blaster. (Avengers I#121) - The Zodiac lost their stalemate when the Scarlet Witch ruined the Star-Blaster, but they managed to flee after Aries knocked Mantis off the World Trade Center. Later, Scorpio participated in a meeting with Aries, Pisces, Cancer, Sagittarius, Leo, Libra and Aquarius in which they planned to usurp leadership from Taurus, and planned to meet with their financier Cornelius Van Lunt in order to gain his support. However, a meeting with Van Lunt, the Avengers appeared. As they fought, Van Lunt fled, and revealed himself to be Taurus. He then trapped the Zodiac traitors and Avengers within his warehouse, and launched it into space. (Avengers I#122) - Scorpio and the other traitors continued to battle the Avengers aboard Taurus' space trap, until the Vision pointed out the futility of their battle. Iron Man was able to bring them all back to Earth safely, but as they prepared to engage Taurus, Taurus observed that the Avengers were certain to send them to prison. They then turned on the Avengers and aided the rest of the Zodiac, but were defeated by the Avengers. (Avengers I#123 - BTS) - The Avengers turned Scorpio over to the authorities along with the other Zodiac members, except for Libra. (Ghost Rider II#7 (fb) - BTS) - Scorpio was sent to prison with the rest of the Zodiac, with the exception of Taurus. (Iron Man I#184) - Scorpio participated in a viewscreen-only meeting with the other 11 Zodiac members, during which Taurus explained his intent to destroy Iron Man with a bomb to prevent him from investigating the cartels. (West Coast Avengers II#26 (fb) - BTS) - At some point, an LMD of Jake Fury killed LaPoint and took his place without the rest of the Zodiac realizing it. Having subverted the Zodiac, Fury went on to destroy the entire human membership, replacing them with LMDs. Comments: Created by Steve Englehart, Bob Brown and Don Heck. As a Scorpio, Jacques LaPoint was born between October 23rd and November 21st. The Official Handbook of the Marvel Universe Deluxe Edition and Master Edition's entries for the Zodiac and Scorpio (ME only) claimed that Jake Fury (or his LMD) had always been LaPoint, but Fury never claimed to have always been LaPoint in WCA II#26; also, the Official Marvel Index to the Avengers and Official Handbook of the Marvel Universe Deluxe Edition Scorpio entry both consider LaPoint to have been killed and replaced by Fury. Besides this, Jake was supposed to have spent the time inbetween Nick Fury I#5 and Defenders I#46 creating the Theater of Genetics, sinking into depression, and viewing the Zodiac from the outside-- it hardly fits for him to have assumed the guise of LaPoint then. LaPoint's accent is the same as Batroc's. Interesting, considering he's not even from France. LaPoint may be one of the only cajuns in comics who has nothing to do with Gambit.